A medical marijuana facility - called the "worst kept secret" in Queens County - is set to open in the Port Mersey Commercial Park in Brooklyn. 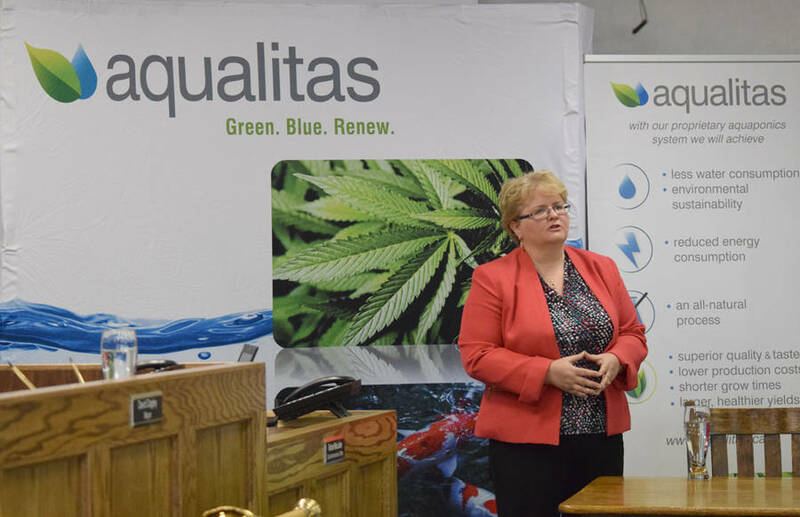 The Bedford-based company Aqualitas took possession of its building at the former Bowater mill on June 1 and plans on growing cannabis using a technology called aquaponics. The company's chief executive officer Myrna Gillis said the site is expected to bring upwards of 60 jobs to the area, most of them local. "As the industry grows so will we," she said. Rumours have circulated for months about a medical marijuana facility opening in Queens. On June 13, Gillis gave a presentation to the Region of Queens Municipality to explain the company's operations and plans at Port Mersey. Several company representatives were also present. "I'm pleased as mayor that they are looking to be in Queens, and they have signed a lease with Nova Scotia Lands at Port Mersey," said Mayor of the Region of Queens Municipality David Dagley. "They'll provide good jobs, good paying jobs, good quality jobs and be a good local business to have in our community." Aqualitas was formed in 2014 and uses aquaponics, a process that involves growing fish, in this case koi, and plants together. Bacteria break down the ammonia excreted from the koi into nitrates, which the plants then use as nutrients. This means fertilizer is not required and the plants act as a natural filter, returning clean water back into the fish tank. No pesticides are used and the cannabis is produced more quickly and cleanly, according to the company's website. It claims the technology uses 90 per cent less water and 70 per cent less electricity. Gillis said Queens County was chosen for its "job ready market." She said the people who worked at the former Bowater mill have transferable skills which can be applied at Aqualitas, from trimming and harvesting plants to steam experts and scientists. The Bowater mill closed in 2012. The Crown corporation Nova Scotia Lands currently runs the site under the name Port Mersey Commercial Park. Rural development and the existing security on site were also important factors for Aqualitas. "We had a good feeling just about their genuine desire to have the community reinvigorated, to have a replacement industry," said Gillis. "This is the fastest growing industry in the world and what a nice sort of place to bring it." Aqualitas does not currently have a Health Canada licence to produce marijuana but is in the stages of acquiring one. The company is working with local contractor HRS Industrial and hopes to have the facility ready in October or November, with hiring taking place not long after, and be approved for cultivation in early 2018. "We think our timeframe is realistic, but it really just depends on when someone gets to the file," said Gillis. Offices and a cafeteria are finished and a production space of up to 70,000 square feet could be ready in two months. Neither Aqualitas or the Region of Queens has determined what the economic spin off will be for the area, but Gillis said the company could produce anywhere from $2.5 million to $70 million a year depending on capacity. Some estimates have pegged the financial benefits in the tens of billions of dollars when taking into account medical purposes, research and eco-tourism, said Gillis. Gillis said marijuana legalization wasn't even on the company's horizon when it entered the industry, but with nation-wide legalization set to occur next year it remains to be seen whether the community will welcome a marijuana operation. Dagley said Aqualitas has done its research and has been respectful to the community. The site, he added, is secure and surrounded by the Atlantic Ocean. "It's very difficult for anything that is occurring on the site in this operation to impact residents off site," he said. "I think once residents look at the operation and understand exactly what it involves, I'm not expecting much concern from any local citizen." Former mayor Christopher Clarke expressed a similar outlook. Clarke, who lost the mayoral race in 2016, said council has been working on the project for a long time. "When I was campaigning last year, the only question I got was, 'Why isn't it here yet?' I didn't run into any people saying, 'Oh, we can't have that in our community.'" Clarke said the goal has been to increase employment at Port Mersey to the level it was when Bowater left, which was about 200 employees. As of December 2016, the site had 102 full-time and 54 part-time employees. "With these 60 jobs plus, I think you'll find it brings it up to that 200 employee level," said Clarke. "The goal is being achieved, now the goal I'm sure is to grow it more." Gillis said the company will be able to trade with other countries including Germany, Brazil, Australia, New Zealand, Croatia and the Cayman Islands. "There's already a fairly robust export market and Canada as a G7 country is really seen as the gold standard." The company has also made applications to produce cannabis oil and sell seeds for home growers. Its ability to produce edibles will depend on the forthcoming regulations. Aqualitas also owns a research and development subsidiary called Finleaf Technologies Inc.
Finleaf, with support from the National Research Council Canada Industrial Research Assistance Program and Innovacorp, is conducting aquaponics trials with Acadia University. The company is also researching development opportunities with the assistance of Bioenterprise Corporation, a company that helps agri-technology ventures, and is working with Dalhousie University on a fish environment design prototype. Gillis said Green Relief outside of Hamilton, Ontario, is the only other medical marijuana company using aquaponics.